The Comfort Aire BHD651G Dehumidifier is an effective appliance that will control excess moisture in a basement of up to 1200 square feet. The BHD651G is certified by Energy Star® and is able to remove up to 65 pints of water every 24 hours. This model can operate without risk of damage at lower temperatures but will not perform well in a cooler basement, below 65°F/18°C. The Comfort Aire BHD651G Dehumidifier has all the features you would you might need, including a 24 hour timer. In reviews of this model users say that it is quieter than most others they have used. There are however frequent complaints that the BHD651G has broken down within a couple of years from the purchase date. While I cannot say that this is the best model in its class it is better than many others and, if its features make it attractive to you, I would not advise against it. 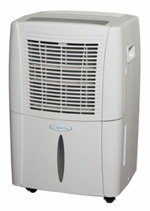 The Comfort Aire BHD651G Dehumidifier is similar in size and weight to other high capacity models. It has carrying handles and casters to make moving the unit easier. When the cold coils ice up a sensor triggers a switch that stops the compressor until the ice melts. This feature protects the BHD651G from damage in lower temperatures but you will find that the dehumidifier does not remove much moisture below 65°F. A cold basement really needs a low temperature dehumidifier. A sensor checks the humidity constantly. All you need to do is to set the humidistat to your chosen humidity level and the sensor will cycle the compressor on and off to keep that level constant. A level of 45-50% will stop the mold and should be comfortable for you. The BHD651G has a large 21 pint water collection container but even that big bucket will have to be emptied once or twice a day. By attaching a few feet of garden hose to a port in the dehumidifier you can let the water run straight to a floor drain and save yourself the trouble. Electronic controls are a pretty standard feature on large capacity portables and you will find these easy to use. All the information you need is shown on a digital display including indicators to tell you that the bucket is full or the filter needs cleaning. The filter is very important as it protects the appliance and extends its life. The filter in the Comfort Aire BHD651G Dehumidifier slides in and out easily and should be removed for regular cleaning. The manual recommends you do this every 30 days but I would say once every two weeks is better. When you first start your new appliance you will need to run it on the higher fan speed to get the humidity level down. Put up with the extra noise :). It shouldn't take above a couple of days and once humidity is under control you can use the lower, and quieter, fan speed to keep the level constant. Everyone suffers a power outage at some time; usually the most inconvenient! Auto-restart simply switches the unit on at the last programmed settings as soon as the power is flowing again so you don't need to worry, even if you're away from home. The timer is one of the features that makes some folks opt for the BHD651G in preference to other models. It allows you to program the unit start and stop times over a 24 hour period which is more flexible than timers on most other models. Those, like me, who are concerned about our planet will be glad to know that the BHD651G uses R-410A refrigerant which does not damage the ozone layer. User reviews of the BHD651G are a pretty mixed bag. Some owners rave about this unit and think it's the best dehumidifier ever while others use phrases like "a piece of junk" to describe it. It is important to look at the date on which any review was written. Some pretty old reviews are out there, back to 2006 at least, and many don't apply to the current Comfort Aire models. The main beef with the BHD651G is that it doesn't last long enough, maybe a couple of years or so. On the other hand many reviewers praise the build quality and the relative quietness of this unit. Most users like the electronic controls and a number have bought the BHD651G because they need a more flexible timer than they can get on other manufacturers' models. The first thing to say here is that the complaints about the Comfort Aire BHD651G Dehumidifier are pretty much the same as you will read about any other. You won't thank me for saying so but there are no portable models sold in the USA that you can expect to last more than a couple of years. If you look at reviews written during the last 12 to 18 months you will notice that this unpleasant reality is being recognized by more and more users. Bearing all that in mind I am going to discount this criticism and say that, compared with the alternatives, the BHD651G is among the best portable models that you can buy at this time. On balance I would still put the better known brands, Danby, Frigidaire, GE and so on, a few points ahead but, if the BHD651G offers you something you need that the others can't provide, such as the timer, you could do a lot worse than to choose the Comfort Aire BHD651G Dehumidifier.